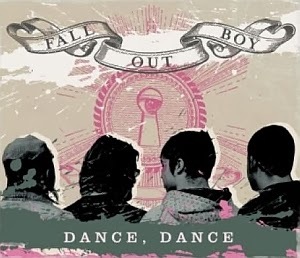 "Dance, Dance" is a song by American rock band Fall Out Boy and the second single from their second studio album, From Under the Cork Tree. Released in late 2005, in the United States it reached No. 9 on the Billboard Hot 100 in January 2006, becoming the band's second consecutive top 10 hit single. It was a crossover hit as it simultaneously went top five on both Alternative (No. 2) and Pop (No. 5) radio. The track also reached No. 6 on the defunct-Pop 100. It was certified platinum by the Recording Industry Association of America (RIAA), and has sold 2,170,000 copies in the US as of July 2013. Internationally, the single reached No. 8 on the UK Singles Chart, becoming their second top 10 hit in that region as well. On July 22, 2013, "Dance, Dance" was certified Silver by the British Phonographic Industry (BPI) for 60,000 sales. It has won many awards, including Viewer's Choice at the MTV Video Music Awards and two Teen Choice Awards, and also received various nominations. The music video shows the members of the band performing at a homecoming dance, and simultaneously attending as nerdier versions of themselves, overcoming the persecutions of more popular students. The video starts with "A Little Less Sixteen Candles, a Little More "Touch Me"". The end scene of Pete dancing is a parody taken from Revenge of the Nerds. The music video was filmed at Salesian High School, which is located in New Rochelle, New York, a suburb of New York City. A cameo is made by Ben Jorgensen of the rock group Armor for Sleep and Travis McCoy of Gym Class Heroes. From Under the Cork Tree is the second studio album by American rock band Fall Out Boy. It was released on May 3, 2005, through Island as the band's major label debut. Fall Out Boy is an American rock band from Wilmette, Illinois, formed in 2001. The band consists of vocalist/guitarist Patrick Stump, bassist Pete Wentz, guitarist Joe Trohman, and drummer Andy Hurley.